I’ll be perfectly honest – I was predisposed to not like this book. I actually found the very fact that it was published at all to be disrespectful to Michael Crighton’s legacy. It was published posthumously, you see. And while that may have been perfectly acceptable had Crighton just completed the finishing touches, but hadn’t yet got it to the publisher, my understanding is that this was far from the actual case. In fact, indications were that Crighton had written this book many years ago, and had chosen not to publish it – presumably because he didn’t feel it met his standards for public consumption. So yeah, I thought it rude of Crighton’s estate to disregard his apparent wishes regarding this book – but hey, what do I know? I could be dead wrong on my interpretation of the situation. And so I attempted to read Pirate Lattitudes with a clear mind, and to evaluate/enjoy it without dwelling on the circumstances of its publication. Colonial Jamaica is painted with surprising – and – refreshing, realism. This isn’t the romanticized pirate haven you’d likely find in a swashbuckler film, but rather the outskirts of civilization – at once a booming economy and a disgusting slum. Filth runs through the streets, prostitutes have boils and missing teeth, and the governor is on the take. This is the Port Royal of history, not Hollywood, and it makes for a wonderfully educational (if unhygenic) exploration for the reader. Just as the Jamaica of Pirate Lattitudes stands in stark contrast to most other fiction, the plot also deviates from the norm. 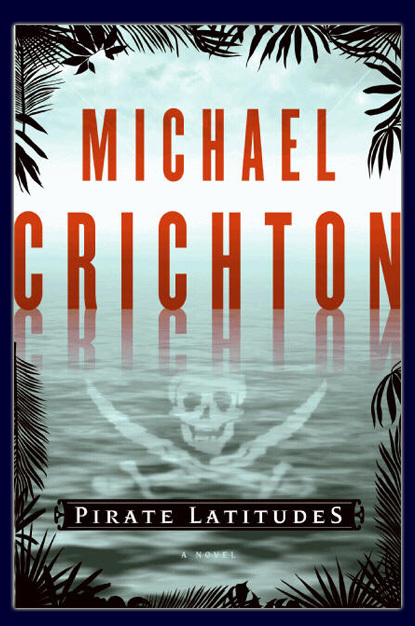 Rather than a tale of rebellion or isolation so often found in pirate novels, Lattitudes is more on par with Mission Impossible. Indeed, Hunter is tasked with a seemingly impossible job – the raiding of an impregnable Spanish fortress, commanded by the merciless Captain Cazalla. To accomplish such a mission, Hunter recruits the aid of a handful of privateering veterans, each of whom share a history with Hunter, as well as their own unique skill sets, be they explosives, navigation, or murder. With Cazalla dead, his second-in-command takes over in a manner not unlike if a lead actor in a movie died half-way through filming. Except, as a book, why change characters? Perplexing, yes. But I won’t dwell. Moving on, we find the Spaniards in hot pursuit of our heroes and their hoards of ill-gotten booty. There’s ship-to-ship combat, of course. And a hurricane. And a brief encounter with cannibals. And a kraken. And… I really lose track. The apparent primary drive of the story is over, but as with The Odyssey, the simple act of getting home is one unrelated obstacle after another. And I thought travelling under the iron thumb of the TSA was bad. This second half of the story feels like one big epilogue, with every half-baked idea Crighton might have had thrown all together into one jumbled mess. And it doesn’t end when our heroes return at last to Jamaica, as the political tides have shifted and privateering is no longer quite as tolerated as it once was. Trials and turncoats, poisoned governors and daredevil whores, it’s all here and more. Pirate Lattitudes began surprisingly strong, but ends like a TV series with too many writers and not enough cohesion. Personally, I can see why Michael Crighton never chose to publish it – the bones of a great novel are there, but this isn’t yet it. Much of it is fun, some of it’s silly (Hunter’s ‘way with the women’ seems sadly dated in an 80’s action flick sort of way), and some of it’s downright bizarre. Still, it can be quite enjoyable, and I remain impressed by the novel’s willingness to discuss such obscurities as tactics, weapons, strategy, and even the contents of the average bilge in a way that’s both informative and fun. This isn’t a book to be ignored, but it’s hardly the book it should have been. 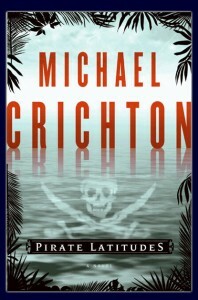 This entry was posted in Books and tagged michael crighton, pirate latitudes by Bilgemunky. Bookmark the permalink. I thought that the book felt unpolished. The raw ideas were there, but Crighton died before he could finish the work properly, or at least he lost interest before he ever really finished it. A tad disappointing this is, as the last work of a great author. Read this a few weeks back and felt like I was reading every pirate story ever written. Every character both fiction and real were in this story. Combine this with a very short book and it was just to full of stories lines and not enough character development. I did enjoy it though for its raid on the city and the dirtier more true pirate talk in the book. This book struck me as a first draft of a much longer novel (perhaps more than one). I believe the second novel would have taken place in modern times. Recall when evaluating their loot, the pirates are disappointed to find a chest that contains not silver, but platinum “a metal of little worth.” Then the pirate second – in – command simply disappears with half the loot, only to turn up at the end with no loot but a medallion bearing “a series of intersecting triangles,” (or something of the sort, I don’t have a copy handy.) I think in the second book somebody would find the medallion and interpret it, perhaps using high tech, computers, etc. Of course, that chest of platinum would be worth millions now. Or maybe it was intended to be one long novel within a frame, beginning in modern times with the finding of the medallion, then the pirate story, then back to modern times for the treasure hunt. Whichever, it’s a pity Crichton never got to finish it to his satisfaction. We might have had a great pirate classic instead of an intriguing might-have-been.